Vignt-cinq :: Happily playing with everything except a kid-friendly toy. One of Avienne's favorite little corners of our house is right here, where she can easily pull open every drawer full of things she's not supposed to be playing with. This area is always a mess of tossed paperwork, camera parts, CDs and whatever else we've managed to cram into those rolling cabinets. 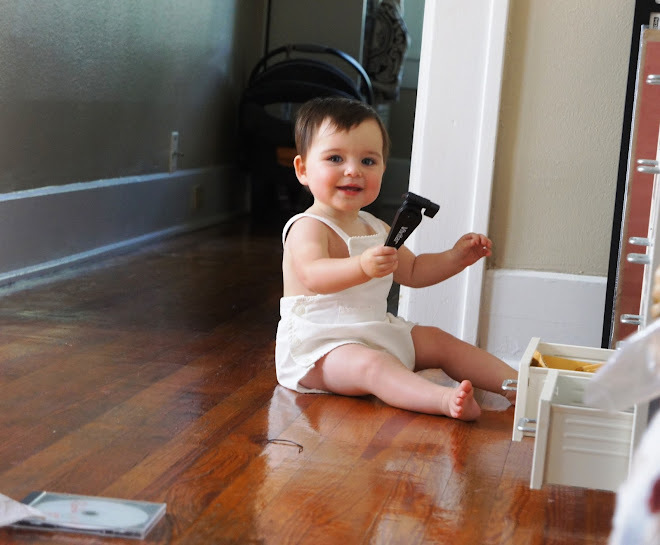 No matter how often she goes through these drawers, though, she always finds something new that she can treasure for the day and carry along with her to the next room. She really keeps us on our toes, but I sure do love her enthusiasm for exploring everything big and small around her.